With a with a title like This Ain’t No Disco it’s tempting to reply that this ain’t no musical, either. 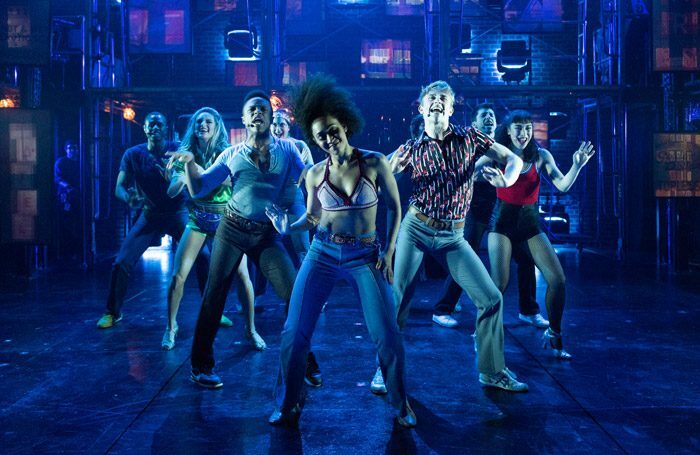 Instead, it’s an impressionistic jumble of songs and scenes that aim to recreate the spirit of the late 1970s and early 1980s club scene in New York, and in particular the heady cocktail of music, dancing, sexuality and celebrity around Manhattan’s iconic Studio 54. So we get name-checks of some of its more famous patrons like Liza Minnelli, Elton John and Bianca Jagger, and a character simply called the Artist who’s blatantly modelled on Warhol (he even gets to spout his line about “15-minutes of fame”). As played by Will Connolly, the latter wanders through the action distractedly, with hair like a kitchen mop. What we don’t get, at least with any substance or continuity, is a through-line of character or plot, as a succession of different people vie for attention and stage time. It’s impossible to get to know or care about anyone and Darko Tresnjak’s relentless production is a visual and aural assault course, with dizzyingly blinding lighting from Ben Stanton, and a set of scaffolding platforms and projections that recall the milieu of another grungy club-land musical Rent. Co-composers Stephen Trask (creator of the 1998 underground cult hit Hedwig and the Angry Inch) and Peter Yanowitz offer a succession of pulsating electronic beats from which tunes only intermittently break out.It was enough to make me nostalgic for the Pet Shop Boys 2001 musical Closer to Heaven, which at least had some great melodies. For anyone who wants a real reminder of disco excess, Summer, the biographical musical based on the life of Donna Summer, at least comes with a slew of great, familiar tunes.